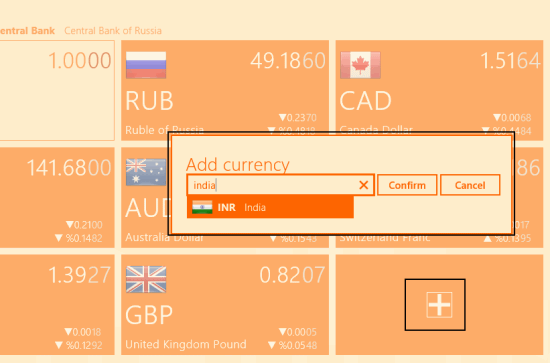 Currency Tracker is a free Windows 8 Currency Tracker and Converter app. In this app, you can check the rates of any currency and you can also convert the value of any currency into other directly through the app. 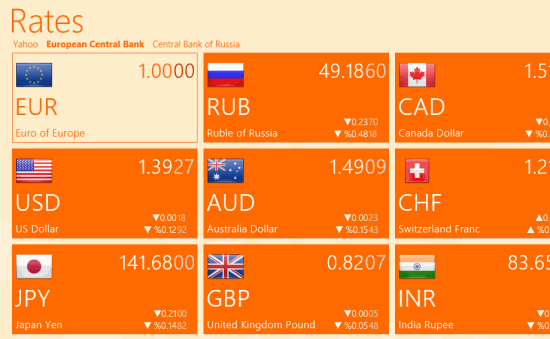 You can also check the opening and closing values of all the currencies. 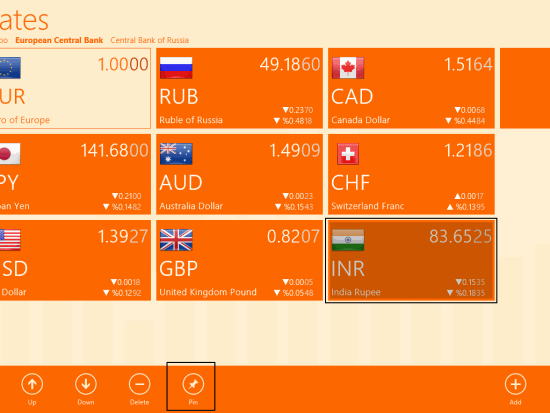 This app also lets you pin any currency to the Start screen of the Windows 8. If you want to access any currency’s details and its opening and closing values, then you can add that currency on the home screen of the app so that you can access it directly from there. 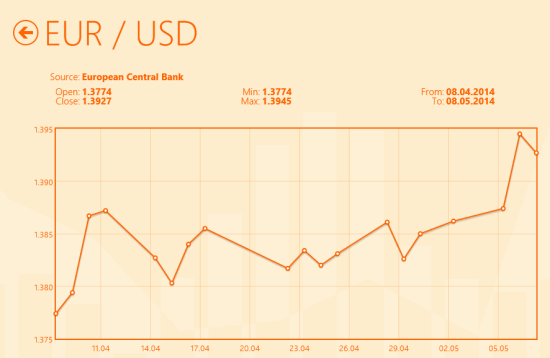 The opening and closing values of currencies is provided by European Central Bank, while the rates are provided by Yahoo, European Central Bank, and Central Bank Of Russia. The app has a great interface and is very easy to use. No ads to disturb you. Statistically shows the opening and closing rates of currency. Provides currency converter as well. Data is provided by reputed organizations: European Central Bank, and Central Bank Of Russia. You can get Currency Tracker app free from Windows store by using the link given at the end of this review. After launching the app, you will find different currencies tiled on the home screen. Each currency contains the name and the flag of the country it belongs to, rate of currency (with respect to Euro), the rise or fall value, and percentage of each currency. Click on any currency to view its rise and fall value in last two days. The values are shown in graphical form. You can also pin any currency on the Start screen of your Windows 8 PC. To pin any currency, right click on that particular currency. You will find Pin option in the bottom flyout. If you can’t find your currency on the home screen, you can add that currency as well. To add any currency click on + sign available on a tile. Then type the name of your country in the provided box. It will automatically collect all the data regarding that currency in no time. On scrolling right, you will get a converter. Using this currency converter, you can easily convert an amount in one currency into another. Currency Tracker is one of the best apps to track the rates of currencies. But the app needs to add some more features like showing news regarding rates. The statistics showing rise and fall of rates of currencies and the converter makes the app more useful. So if you are looking for an app which updates you regarding currencies, then you must try this app. Get Currency Tracker app here. Similar apps: Currency Rates Converter, Currency Converter +, ConvertorS.